Grabber Tube, Channelizer Tube, Tubes, Traffic Tubes, and more from Trans-Supply.com ! Convenient T-top carry handle and molded in bolt hole for flashing light (new longer handgrip area). Improved recesses create a deeper area for reflective bands - stronger ribs provide maximum band protection. 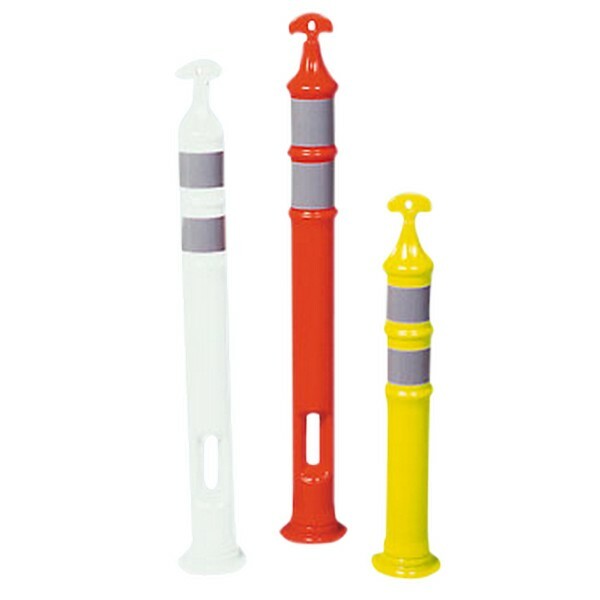 These T-top delineator posts are manufactured using state-of-the-art technology. New precision molding machines produce consistent, high quality parts. Post Height 18", 28", 36", 39" and 42"
All specifications and descriptions are subject to change without notification. What exactly are ‘Delineator Post Bands’? These bands are strips of reflective tape that make the bands easier to be seen especially when light is shined on them, as the light reflects back. 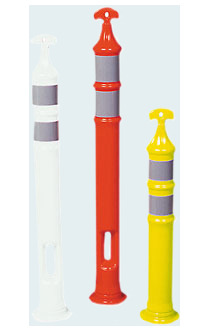 This looks like a T Top Delineator, why is it called a Grabber Delineator? Grabber and T Top are just two different brand names for a type of delineator where the top has a handle that makes it easy to grab. We have two names to let people know these products are virtually the same. Can these stand up on their own? They can but will knock over very easily; we always recommend buying them with bases. What bases will work for areas with medium to high wind speeds? For 20-30 mph winds you should use at least an 18.5lb base, for 30-40 mph add an 8lb base on top of the 18.5lb. I need these right away, how soon can they ship? Lead time varies because it depends on what is in line for production at the moment and the quantity and type of delineator you are ordering. Please call about lead times. Shipping depends on your zip code and the delineator/base options you choose along with the quantity you need, so please call or email for a custom quote.